The first thing to be clear about is the distinction between vegan and vegetarianism. Vegetarians don’t eat any meat products, and this is called an avoidance diet – they avoid foods that they object to for ethical, spiritual or health reasons. Vegans, on the other hand, embrace a lifestyle that removes not only all meat but also associated by-products that have meat based ingredients or processes as well. These by-products are very wide-ranging and include bread, honey, wine and lots of other unlikely foods, some of which are listed below. When cooking for vegans, you have to avoid using any of these products. Many vegans would say that their lifestyle is therefore not an avoidance one, but a style that embraces a completely different philosophy of cooking and sourcing food. There is no distinct style of vegan food, as it has many regional variations and ranges of local ingredients and cooking techniques – the only defining feature is this refusal to use animal ingredients or by-products. The good news is that you don’t have to completely re-equip your kitchen and buy totally new foods to produce tasty vegan food. 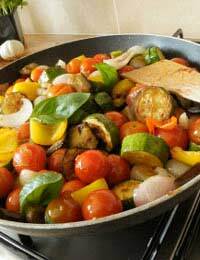 In fact, exploring this style of cooking can add a new range to your diet. To begin cooking vegan food successfully, you may need to think differently about food as a whole, for example, most vegan meals will be more self-contained than meat based cookery – while a meat meal will generally have three main components: meat, a carbohydrate such as pasta, rice or potatoes, and vegetables. A vegan meal will tend to be more like a curry, stir fry or stew, in that it will contain many ingredients combined in a single dish and will often be served with a side dish that complements the main one, such as curry with a bean salad, stir fry with noodles and a stew served with bread. Vegan recipes are noted for their range of various herbs and spices which give variety and savour to the food. Another plus to mastering vegan cuisine is that it can lead to you making healthier food choices more generally. This is because vegan recipes are often based around fruit, vegetables, and whole grains which provide vitamins, minerals and lots of fibre, while being low in saturated fat and cholesterol. Sugar – nearly half the sugar produced from cane is filtered using animal based carbon. Beet sugar tends not to be animal-carbon filtered but you need to read the packet and find the vegan symbol to be sure. Wine – finings are used to clear wine and they are made from fish by-products. There are some vegan wines that use mineral based finings but you have to read the label carefully to be sure they only use minerals, not both. Gelatin – is made from either fish or meat by-products. Soups and stocks – even some vegetable stocks have beef by-products in their ingredient list and nearly all soups contain some meat by-products. Bread – many breads are made with milk or eggs. Those that aren’t, may still contain animal shortening in the form of lard. Worcestershire Sauce – which many of us rely on for seasoning savoury dishes, is based on anchovies! Fry the onion and garlic in the olive oil in a large pan. In another large saucepan, cover the potatoes, carrots, and celery with water and bring to a boil then cook until just tender, around ten minutes. Drain and set aside. Now add about half a litre of water and the stock cubes to the large saucepan. Add the chilli and cumin, thyme and coriander and then tip in the potatoes, carrots, and celery. Cook together for about five minutes and then add the tomatoes before bringing to a boil, reducing the heat, and simmering for around 45 minutes. Season with salt and pepper to taste before serving.